Latest Reunion with links to earlier ones. Amslers reunion 1977 Amsler reunion Apr 77, Austin TX, at Phil Amsler's archery shop. Let me know who you recognize and I will eventually include names in the description or on page that brought you here. After viewing the album, use browser back button to return to this page. These images are stored on this site until uploaded to a central host for all images related to amslers web site. Amslers reunion 1973 Reunion on Thanksgiving 1973 at Phil Archery shop in Austin, Texas. Note on reunion73a image, “also held in 1974” .. Location of 1974 images unkown. If you have photos of 1974, please contact sammy so he can add photo album for 1974. These images are stored on this site until uploaded to a central host for all images related to amslers web site. After viewing the album, use browser back button to return to this page. 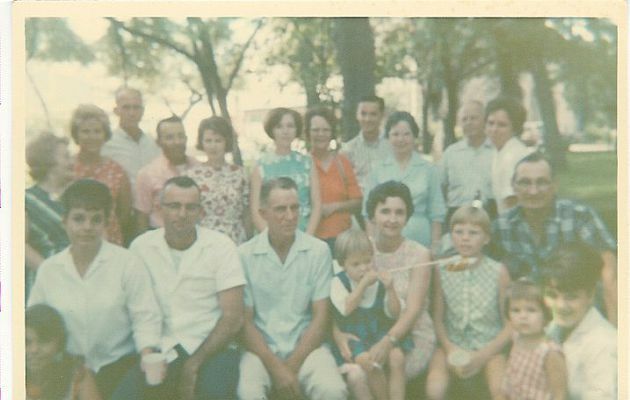 Amslers reunnion 1965 Family reunion in San Antonio Texas in summer of 1965. Most of the family gathered at the park and many rode the minature railroad. List all that you recognize by name in photo please E-mail: [Sammy Amsler]describing image name with names so that the names can be matched with those in the photos. Thank you for visiting family web pages hosted by Angelfire and Austin.rr.com. Please visit again! Also, please sign guestbook. Your comments and suggestions are most welcome. You may notice from above links that old photos are unique and tell a story regardless of their condition. The Amslers' family tree contains scanned photos from Newspaper clippings displaying William Tell (Papa) Amsler’s parents and grandparents, the Flatos. Papa’s grandfather Flato was one of the founders of Flatonia, Texas. The images were published in a souvenir program printed in 1973. This souvenir program was supplement to “The La Grange Journal”; “Moulton Eagle”; “Schulenburg Sticker”; “Smithville Times”; “Tribune-Herald” (Halletsville). Such photos have an even more unique character. When visiting sites and link back to this index page is omitted at bottom of page you may use back button to return to this page.